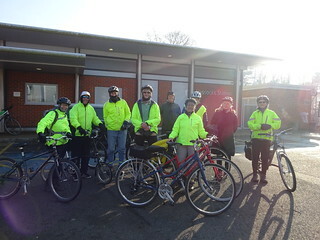 Nine riders assembled at Hassocks station, 8 came by train & Angela C. was kindly delivered by her son & picked up at the end in Lewes. All delighted to have new member, Wendy, join us at Brighton station for the day’s adventure. While awaiting a tenth, a walking group member from across the road was recruited as photographer for the group photo. 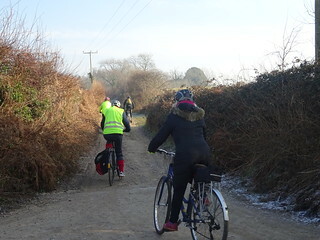 As the missing 10th rider was a new Clarionista, Tessa tried to contact him, but no joy [till lunch time], so ten minutes later we set out as it was chilly & the ice was started to penetrate our extremities! Sun was shining brightly on us as we strung out along the Keymer Road to Spatham Lane. The other Angela was feeling the cold penetrating her asthmatic lungs & with Sean Burke volunteering as backstop, & me with the wrong cold weather gear on-three asthmatics made up the rear, while the sprightly avant guard led the single file. Some of us were glad of the uphill to warm the joints, but all of us glad to reach the lanes & leave the traffic polluted roads. Now a new hazard emerged … ice! Up till now [then] winter had been mild & sunny for us, apart from 1 day’s snow, which quickly disappeared, but, like Trump’s election & dreaded Brexit, looks like Winter’s Bane [excellent film!] was coming to engulf us now. There were huge marches of protest against Trump & Tory follies the previous day, but a winter of discontent looms over us now. Some bravely rode the ice filled lane but walking was allowed too, & my preferred option, though I’d walked a good few miles yesterday with John McDonnell [Shadow Chancellor] holding the banner high & leading the way from local hospital to Brighton Station opposing the so-called Sustainability & Transformation Plan which seeks to privatise our NHS. 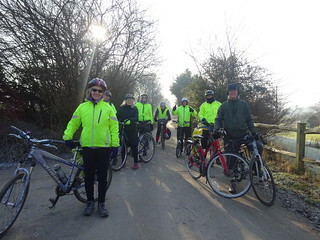 Our leaders Sue & Tessa, had recce’d their ride as recently as previous Wednesday & it hadn’t rained since but had become colder, so they frequently consulted us to modify the routes, in order to keep us as warm as possible. So, our coffee stop at The Jolly Sportsman was cancelled due to high price of coffee there too [£4 ] & prospect of warming stop at The Plough was also cancelled due to majority vote for keeping up the pace in order to keep warm! After the non-stop at The Plough, next stop was at Plumpton Green, but this was both unplanned & delightful surprise. Just as both Mick & I were talking in separate conversations about Sean T. & Jane T, who live in Plumpton Green, Jane hailed us from the pavement & invited us back to theirs for hot coffee, even though Sean was confined [& cribbed] hard at work doing his marking. They were both very busy & some of us still cold, so pressing onwards won the day again. As soon as we reached the smaller lanes again we hit the ice. This time, more literally, as our gallant backstop, Sean B. on his Brompton, took a slow paced tumble, just as we could see a descending cyclist taking the narrow path at centre of ice strewn hill & rushing towards us. The young man was kind & solicitous to Sean & was assured that he was OK before we all scrambled up between the icy path to the summit where warmer lane & extensive views met us. When we reach Offham -having stopped to take a photo of the beautiful, blossoming Old Man’s Beard in the hedgerow. Sean & I were last again & forgot the instruction to cycle on the pavement along the busy A275 & took the road, but survived & soon all reached the outskirts of Lewes & the riverside walks & pleasant parks where families were enjoying the winter sun. Now we can lock up the bikes & enjoy the warmth of the pub by the river & have some fine food & ale & even cakes! [torte actually]. A long table had been reserved for us & drinks soon served. 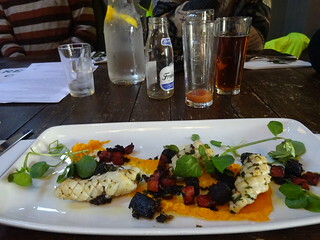 Food was more complicated as both Sean & Mick & Tessa had food delivered to them & then removed! Sean was just about to tuck into mussels cooked in ale, though he thought he’d ordered sea bass & trout & Mick was admiring a veg roast, when the young waitress realised that she had been too hasty & mixed up the tables. When ours did all arrive shortly afterwards everyone was pleased & Mick & Sue couldn’t resist the chocolate torte & mandarin sorbet pud to share, which all-comers were invited to stick a teaspoon in & savour. That was the final ice of the day. Thanks to Tessa & Sue for organising a super winter excursion for us all & to Sean for ensuring we all survived the icy conditions & enjoyed the winter sunshine, which never seemed to rise to the 6C. promised in the forecasts. I shall rethink my winter gear next time we set out on bikes, though really only toes that succumbed to ice. Now we have freezing fog surrounding us & so glad & grateful for Clarion’s fun & joy yesterday. This entry was posted on Monday, February 6th, 2017 at 12:13 pm and is filed under Ride report. You can follow any responses to this entry through the RSS 2.0 feed. You can leave a response, or trackback from your own site.